In the UK the Gulf brand is used under licence (from US owners) by GB Oils (owned by the DCC Group), also the owners of FloGas LPG suppliers. GB Oils purchased the brand and distribution business from the Bayford Group in 2010. 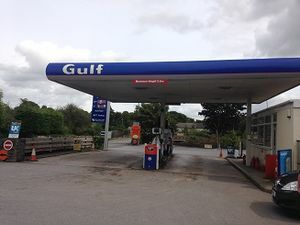 Gulf was formed with the Bayford Group's purchase Burmah Oil in 1993, gaining a foothold in the petrol forecourt business. Bayford's start as a large player in the fuel forecourt business started with the purchase of Save Group PLC out of administration in 2000. This was followed by the re-brand into Gulf. Bayford also brought 30 Elf forecourts from Total at the time of merger, mostly sites in Yorkshire. Gulf are one of the few government licensed companies to sell Leaded Petrol (4 Star).